The euro fell to a 12-year low in value against the US dollar this week, when it crashed to $1.054. The currency also hit a seven-year low against British pound sterling, currently being valued at £0.71. Much has been said about the cause of this fall in currency was linked) and its impact on investments and exports. But the implications for the superyacht industry are far more significant. If a potential owner exchanged US dollars to buy a superyacht priced in euros – let’s say a €10 million yacht, to keep the maths clean – it would cost them $3.2 million less than if they bought the yacht a year ago. That’s because the superyacht, which would have been worth $13.8 million this time last year, is worth $10.6 million right now. Lloyd Eagles, Head of Trading at OPT FX, a specialist in foreign exchange, advised risk averse buyers, who will be exchanging US dollars or British pound sterling to buy a superyacht listed in euros, to take advantage of the favourable rates and complete a sale now. But the euro could fall even further to a near 14-year low, Eagles warned. This fall in currency value will attract more purchases in high value euro denominated products, explained Mudassar Malir, a foreign exchange expert and FX dealer at FairFX. "This is especially true for products that don't require to be geophysically located in the Eurozone," Malir said. "So whilst sales of high end cars, boats and jewellery is likely to go up, property sales may not as they may be affected by economic woes of the Eurozone nation they lie in. "With some of the biggest moves in the USD/EUR pair, purchases of superyachts denominated in Euros will likely come from the US and the far east the most. Not to forget the UK as the pound hits 7 year highs against the Euro." Obviously, the opposite applies to owners selling yachts in euros. If an owner listed their yacht for €7 million a year ago, they’d have to achieve a sale price of €9,113,207 to get the same amount of US dollars at exchange today. But it’s not a case of euros vs US dollars vs British pound sterling. The 88.5 metre motor yacht Nirvana was built in steel and aluminium by the Dutch superyacht yard Oceanco and launched in February 2012 to widespread acclaim. She features exterior and interior styling by Australian designer Sam Sorgiovanni with naval architecture by Azure Naval Architects and Oceanco’s in-house team. An award winner at the 2013 Showboats Design Awards, her features include a seven-metre swimming pool, helipad, 80 metre dedicated owner’s deck with private Jacuzzi and sun deck, 3D movie theatre and she is stocked with an array of water sports equipment stored in two built-in toy garages. Accommodation is for 12 guests in six cabins. In addition to her massive owner’s suite – which comprises an office, private sun deck and spa pool – guests are accommodated in five VIP staterooms, including a special VIP that boasts a lounge and his-and-hers bathrooms. Powered by twin 3,600kW MTU 20V 4000 M73L engines, she has a top speed of 20 knots and delivers a transpacific range. Listed for sale by Edmiston & Company, Nirvana is for sale and asking €199 million. The 75.5 meter motor yacht Northern Star was designed by Espen Oeino and she was built by German superyacht yard Lurssen with a launch in 2009. British designer Pauline Nunns gave the yacht’s voluminous interior an ‘English country house’ style and she comfortably accommodates 12 guests in six cabins with room for as many as 26 crew. Guest accommodation comprises a master suite, VIP suite, two doubles and two twins. All have en suite bathrooms. She is helicopter capable, and among the many special features of Northern Star is an ice-classed hull and a range of 7,000 nautical miles. With a cinema, beauty salon and gym, she combines the luxury of a pedigree superyacht with the go-anywhere capabilities of an expedition yacht. 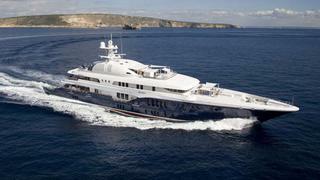 Northern Star is currently for sale and asking €115 million through Moran Yacht & Ship. Jointly listed by Burgess and Merle Wood & Associates, the 68 metre motor yacht_ Sycara V_ is for saleand asking €69.5 million. Lloyds classed and MCA compliant, Sycara V was built by German superyacht yard Nobiskrug and delivered to her owners in 2010, going on to become a winner at the 2011 ShowBoats Design Awards. With exterior styling and interior design by Craig Beal of Pure Detail, the interior of Sycara V is dedicated to spacious living, as can be seen on the main deck, which offers an open space of more than 25 metres from the dining room to the library, providing the feeling of living in a penthouse. The entrance to the yacht leads into a wide lobby with an elevator, which connects all the decks from the lower deck to the sun deck. Her 14 guests are accommodated in seven spacious and well appointed cabins. The bridge deck is mainly allocated to the owner with a private aft deck for al fresco meals. The six guest cabins on the lower deck are situated around the main staircase and, to accommodate families with children, several cabins have additional Pullman berths. There is also a large furnished beach club and she has port and starboard tender bays complete with 31′ and 23′ tenders. Sycara V‘s maximum speed of 17 knots is comfortably achieved by twin Caterpillar main engines with 2,200hp each and a range of more than 9,800 nautical miles, giving transatlantic capability. Dutch superyacht yard Amels built the helicopter-capable 64.5m motor yacht Aquarius to an exterior and interior design by Terence Disdale and delivered her in 2007. The owner’s large family meant that accommodation space was at a premium and it is now possible to sleep up to 12 guests in six cabins. These comprise a master suite and five doubles and all have en suite bathrooms. Lloyds classed and MCA compliant, twin 2230hp Caterpillar engines give Aquarius a range of 5,250 nautical miles. 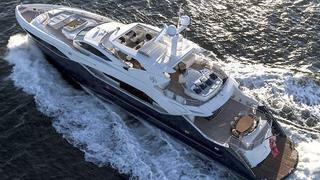 Aquarius is for sale with an asking price has set at €69.9 million at Fraser Yachts. 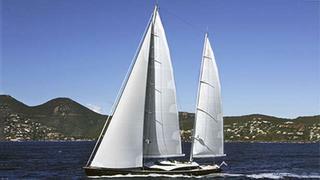 The 57.5 metre sailing yacht Twizzle is for sale and jointly listed by Y.CO and Burgess. Built in aluminium by specialist Dutch yard Royal Huisman to a design by Dubois Naval Architects, Twizzle was launched in 2010 as the yard’s first flybridge yacht. With one of the most advanced sailing rigs ever created, she offers extraordinary performance and carries 1,780 square metres of sail; both main and mizzen sails can be hoisted simultaneously in under two minutes in winds as light as five knots. The interior by Redman Whiteley Dixon was designed to offer plenty of space and light. The main saloon and forward observation lounge provide large, comfortable settees and feature contrasting warm and cool tones that naturally complement each other. Hand-painted silk wall fabrics enhance the decor of the main saloon and the master suite with an airy, summery theme. Three guest cabins in addition to the master suite offer understated luxury for eight to nine guests. All cabins have full en suite bathroom facilities, access to a Kaleidescape server with video and audio on demand and satellite television. Twizzle’s wide open deck areas are fully optimised for open-air living. The centre cockpit flows seamlessly from the main saloon, providing an intimate and sheltered area for relaxing and dining with panoramic views. Under power, twin Caterpillar C32 engines give her a range of 4,000 nautical miles at 11 knots. 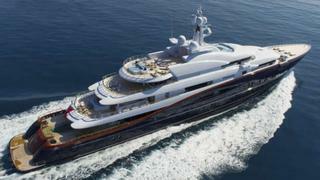 Twizzle was a winner at the 2011 ShowBoats Design Awards and is asking €48,750,000.